For the British swimmer, see Stanley Clarke (swimmer). For the English businessman, see Stanley Clarke (businessman). For the U.S. Air Force officer, see Stanley E. Clarke III. Clarke was born in Philadelphia. His mother sang opera around the house, belonged to a church choir, and encouraged him to study music. He started on accordion, then tried violin. But he felt awkward holding such a small instrument in his big hands when he was twelve years old and over six feet tall. No one wanted the acoustic bass in the corner, so he picked it up. He took lessons on double bass at the Settlement Music School in Philadelphia, beginning with five years of classical music. He picked up bass guitar in his teens so that he could perform at parties and imitate the rock and pop bands that girls liked. Clarke attended the Philadelphia Musical Academy (later known as the Philadelphia College of the Performing Arts, and ultimately as the University of the Arts, after a merge with the Philadelphia College of Art) and after graduating moved to New York City in 1971. His recording debut was with Curtis Fuller. He worked with Joe Henderson and Pharoah Sanders, then in 1972 with Stan Getz, Dexter Gordon, and Art Blakey, followed by Gil Evans, Mel Lewis, and Horace Silver. He intended to become the first black musician in the Philadelphia Orchestra until he met jazz pianist Chick Corea. In 1973, he and Corea founded the band Return to Forever. The first edition of Return to Forever performed primarily Latin-oriented music. This band consisted of singer Flora Purim, her husband Airto Moreira (both Brazilians) on drums and percussion, Corea's longtime musical co-worker Joe Farrell on saxophone and flute, and Clarke on bass. Their first album, titled Return to Forever, was recorded for ECM Records in 1972. Their second album, Light as a Feather (1973), was released by Polydor and included the song "Spain". After the second album, Farrell, Purim and Moreira left the group to form their own band, and guitarist Bill Connors, drummer Steve Gadd and percussionist Mingo Lewis were added. Lenny White (who had played with Corea in Miles Davis's band) replaced Gadd and Lewis on drums and percussion, and the group's third album, Hymn of the Seventh Galaxy (1973), was then rerecorded (the first recording, featuring Gadd on drums, was never released and has since disappeared). Fusion was a combination of rock and jazz which they helped develop in the early 1970s. Like Jaco Pastorius, Clarke was playing a new kind of music, using new techniques, and giving the bass guitar a prominence it lacked. He drew attention to the bass guitar as a solo instrument that could be melodic and dominant in addition to being part of the rhythm section. For helping to bring the bass guitar to the front of the band, Clarke cites Pastorius, Paul McCartney, Jack Bruce, and Larry Graham. 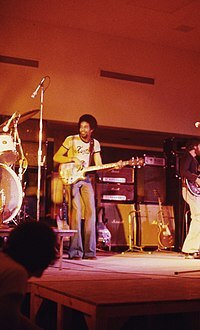 After Return to Forever's second album, Light as a Feather, Clarke received job offers from Bill Evans, Miles Davis, and Ray Manzarek of the Doors, but he remained with Return to Forever until 1977. During the early 1980s, he toured with Corea and Return to Forever, then worked with Bobby Lyle, Eliane Elias, David Benoit and Michel Petrucciani. He toured in a band with Herbie Hancock and Wayne Shorter in 1991. In 1998 he founded Superband with Lenny White, Larry Carlton, and Jeff Lorber. Corea produced Clarke's first solo album, Children of Forever (1973), and played keyboards on it with guitarist Pat Martino, drummer Lenny White, flautist Art Webb, and vocalists Andy Bey and Dee Dee Bridgewater. Clarke played double bass and bass guitar. Clarke's second self-titled album Stanley Clarke (1974) featured Tony Williams on Drums, Bill Connors - Electric Guitar, Acoustic Guitar, and Jan Hammer - Synthesizer [Moog], Electric Piano, Organ, Piano [Acoustic]. While on tour, British guitarist Jeff Beck was performing the song "Power" from that album, and this was the impetus for their meeting and Beck's introduction to Hammer. They toured together, and Beck appeared on some of Clarke's albums, including Journey to Love (1975) and Modern Man (1978). The album School Days (Epic, 1976) brought Clarke the most attention and praise he had received so far. With its memorable riff, the title song became so revered that fans called out for it during concerts. Clarke has spent much of his career outside jazz. In 1979, Ronnie Wood of the Rolling Stones formed the New Barbarians with Clarke and Keith Richards. Two years later, Clarke and keyboardist George Duke formed the Clarke/Duke Project, which combined pop, jazz, funk, and R&B. They met in 1971 in Finland when Duke was with Cannonball Adderley. They recorded together for the first time on Clarke's album Journey to Love. The first Clark/Duke Project album contained the single "Sweet Baby", which became a Top 20 pop hit. They reunited for tours during the 1990s and the 2000s. In 1988, Clarke and drummer Stewart Copeland of the rock band the Police formed Animal Logic with singer-songwriter Deborah Holland. He and Copeland were friends before the Police formed. Copeland appeared on Clark's album Up (Mack Avenue, 2014). In 2005 Clarke toured as Trio! with Béla Fleck and Jean-Luc Ponty. Clarke and Ponty had worked in a trio with guitarist Al Di Meola in 1995 and recorded the album The Rite of Strings. They worked in a trio again in 2012 with guitarist Biréli Lagrène and two years later recorded D-Stringz (Impulse!, 2015). In 2008, Clarke formed SMV with bassists Marcus Miller and Victor Wooten and recorded the album Thunder. In 2009 he released Jazz in the Garden, featuring the Stanley Clarke Trio with pianist Hiromi Uehara and drummer Lenny White. The following year he released the Stanley Clarke Band, with Ruslan Sirota on keyboards and Ronald Bruner, Jr. on drums; the album also features Hiromi on piano. Clarke has written scores for television and movies. His first score, for Pee-wee's Playhouse, was nominated for an Emmy Award. He also composed music for the movies Boyz n the Hood, Passenger 57, and What's Love Got to Do with It, the television programs Lincoln Heights and Soul Food, and the video for "Remember the Time" by Michael Jackson. In 2007, Clarke released the DVD Night School: An Evening of Stanley Clarke and Friends, a concert that was recorded in 2002 at the Musicians' Institute in Hollywood. Clarke plays both acoustic and electric bass and is joined by guests Stewart Copeland, Lenny White, Béla Fleck, Shelia E., and Patrice Rushen. In 2010, Clarke founded Roxboro Entertainment Group in Topanga, California. He named it after the high school that he attended in the 1960s. The label's first releases were by guitarist Lloyd Gregory and composer Kennard Ramsey. Roxboro's roster also includes keyboardist Sunnie Paxson, pianist Ruslan Sirota, and pianist Beka Gochiashvili. When playing electric bass, Clarke places his right hand so that his fingers approach the strings much as they would on an upright bass, but rotated through 90 degrees. To achieve this, his forearm lies above and nearly parallel to the strings, while his wrist is hooked downward at nearly a right angle. For lead and solo playing, his fingers partially hook underneath the strings so that when released, the strings snap against the frets, producing a biting percussive attack. In addition to an economical variation on the funky Larry Graham-style slap-n'-pop technique, Clarke also uses downward thrusts of the entire right hand, striking two or more strings from above with his fingernails (examples of this technique include "School Days", "Rock and Roll Jelly", "Wild Dog", and "Danger Street"). Clarke had been a member of The Church of Scientology since being "turned on" to them by Chick Corea in 1971 - "I went 'clear' - it feels great," he told Gig magazine in an interview in 1977. His first four solo albums all had dedications to L. Ron Hubbard. A Church of Scientology web site reported that Clarke was a member and performed at one of its Hollywood parties in 2012. In 2013, the Morton Report web site wrote that Clarke was no longer a member. ^ a b Yanow, Scott. "Stanley Clarke". AllMusic. Retrieved 12 September 2017. ^ a b c Meeker, Ward (2 February 2016). "Stanley Clarke". Vintage Guitar. Retrieved 17 September 2017. ^ a b c Collins, Catherine; Kernfeld, Barry (2002). Kernfeld, Barry (ed.). The New Grove Dictionary of Jazz. 1 (2nd ed.). New York: Grove's Dictionaries. p. 453. ISBN 1-56159-284-6. ^ Gordon, Ed (5 July 2005). "Jazz Bassist Stanley Clarke". NPR.org. Retrieved 10 September 2018. ^ a b Hobart, Mike (17 June 2016). "Interview: Bass Player Stanley Clarke". Financial Times. Retrieved 18 September 2017. ^ "Stanley Clarke". All About Jazz. Retrieved 31 October 2013. ^ Deriso, Nick (29 February 2012). "Something Else! Interview: Bass-playing jazz legend Stanley Clarke". Something Else!. Retrieved 17 September 2017. ^ a b c Prassad, Anil (1998). "Back to Basics". Innerviews. Retrieved 18 September 2017. ^ Jurek, Thom. "Children of Forever". AllMusic. Retrieved 18 September 2017. ^ Browne, David (16 February 2017). "New Barbarians: Inside Rolling Stones' Wild Seventies Spin-Off". Rolling Stone. Retrieved 29 October 2017. ^ a b Clarke, Stanley (24 March 2014). "Stanley Clarke Remembers George Duke". JazzTimes. Retrieved 19 September 2017. ^ Kohlhaase, Bill (17 July 1990). "2 Musicians With a Meeting of the Minds". Los Angeles Times. Retrieved 19 September 2017. ^ Weber, Carol (5 September 2014). 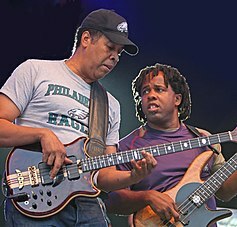 "Bass monster Stanley Clarke picks his friends wisely to go 'Up'". AXS. Retrieved 18 September 2017. ^ Kipnis, Jill (2 July 2005). Three's Company for Trio!. Billboard. pp. 18–. Retrieved 10 September 2018. ^ Collar, Matt. "S.M.V." AllMusic. Retrieved 30 October 2017. ^ a b Berkowitz, Dan (19 July 2011). "Stanley Clarke: A Bass Man and His Upright Desires". Premier Guitar. Retrieved 18 September 2017. ^ Concord Music Group. "The Stanley Clarke Band". Retrieved June 28, 2010. ^ Henderson, Alex. "Night School". AllMusic. Retrieved 18 September 2017. ^ Jackson, Nate (19 March 2011). "Grammy winner Stanley Clarke taps eclectic musicians for his Roxboro push". Los Angeles Times. Retrieved 17 September 2017. ^ "Church of Scientology Celebrity Centre International Celebrates 43rd Anniversary". Scientologynews.org. August 25, 2012. Retrieved 2013-08-07. ^ Press, Skip (11 August 2013). "The Massive List of Celebrities That Departed Scientology". The Morton Report. Retrieved 18 September 2017. ^ "Stanley Clarke". GRAMMY.com. 14 May 2017. Retrieved 17 September 2017. 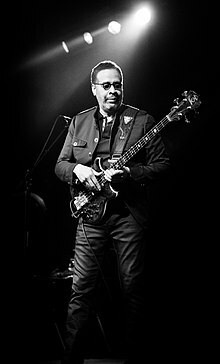 Wikimedia Commons has media related to Stanley Clarke.